Before Body Modern, I had mostly focused on the earlier history and cultural politics of anatomy. In A Traffic of Dead Bodies (2002) I argued that, in the 19th century, under the influence of mass-produced illustrated anatomical publications and popular exhibitions, the American and European public began to develop an anatomical consciousness and identity. People began to think of themselves as anatomical beings, endowed with a geography of parts and boundaries and systems, which were archived as illustrations in books and charts, and as specimens in museums. This anatomical image came to stand as an “effigy of self,” a figural shadow identity, an icon of the real “me,” even if most people had nothing more than a hazy knowledge of the details. For anything more than that they deferred to doctors and surgeons and scientists, who increasingly assumed a position of cultural, moral, and even legal authority over the human body and embodied life. All that was very modern in the 19th century. But modernity is a moving target: what’s modern in one generation, is old-fashioned in the next. When I came upon the mid-20th-century works of Fritz Kahn, that complicated my story. 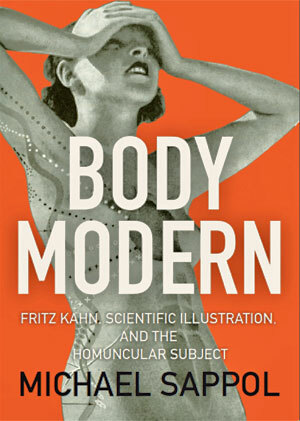 Kahn argued that the older style of anatomical illustration, which showed detailed images of body parts and systems, was no longer scientifically or stylistically adequate for modern readers. A new type of image was wanted: one that conveyed the latest findings of “modern biology” and could show the dynamic forces at work in and upon the human body: a dynamic image that sparked the enthusiasm of the modern reader. Kahn’s best-known work, the life-size 1926 color poster, “Der Mensch als Industriepalast” (“Man as Industrial Palace”), did exactly that. It visually explained the workings of the human body by representing it as a shiny factory complex, full of electrical, mechanical, and chemical processes operated by a force of little workers and managers. 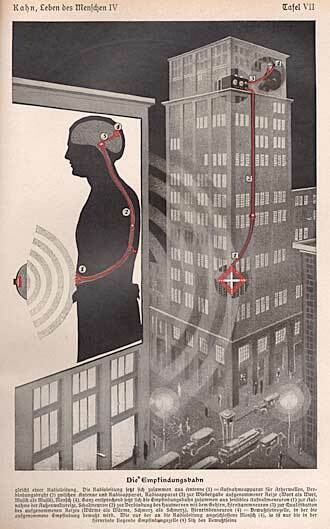 A human body, and, across the street, a parallel diagram showing a radio antenna connected by wire (:nerve) to a radio receiver (:brain) that conveys the sensory input to a man/homunculus listening on headphones (:brain center) in Das Leben des Menschen, vol. 4 (1929). Â© Kosmos Verlag, Stuttgart. Body Modern argues that the homuncular image—in philosophy, a tiny person inside the body or the mind is termed a homunculus—is a hall of mirrors, creates mirror effects. 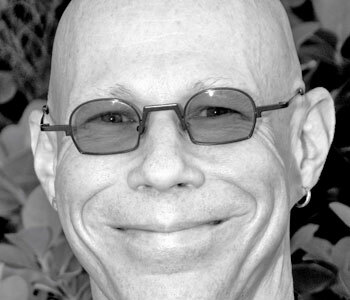 In some incalculably cognitive fashion, we recognize ourselves, and internalize the idea that political economies and arrays of technological devices are inside of us, just as we are inside of the technological and social arrays of the larger industrial world. The printed image becomes for us a homunculus, an effigy of self. We are shaped and influenced by an environment that is full of representations of the human, and full of other humans who are shaped and influenced by representations of the human, and who carry those representations along with them, into all of their interactions. And at the same time, we ourselves provide the same service for others: we are simultaneously homuncular objects and subjects. The human is in the image, the image is in the human.